Don’t let the chill winter winds stop you from enjoying the outdoors. The right outdoor patio heaters can keep your patio warm enough for your family and guests to use during harsh winter months. In warmer states, people still need outdoor heaters to warm their patio area during the winter months. In the current market, there are many patio heaters that are available depending on the space you want to have heated. Many factors need to be considered when deciding which heaters to invest in, such as: square footage of your patio, natural circulation, whether your patio is covered, etc. 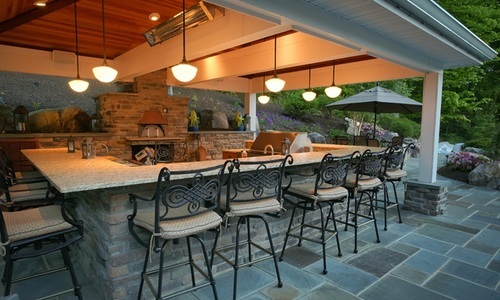 The most common patio heaters are the full sized appliances, the sort that people stand under. Your needs will also dictate what type of fuel your heaters will use; between: electricity, natural gas, and propane. Here are some of the common types of patio heaters. Propane heaters are usually the only type of heaters one thinks of when the word pops up. This traditional heater is the most popular type around. The tall and thin models can be used for both residential and commercial spaces. The best thing about propane heaters is that they are versatile and fit into almost any patio arraignment. The gas fire heaters are another variation that is making waves in the interior designing world. They emit real flames and are treated as brilliant centerpieces of the outdoor patios. Unlike a fireplace or a fire pit with wood logs these make use of a bed of glass rock to mimic natural embers. The gas fire pits are perfect if you own a large outdoor sitting area, have a pool deck, or a patio that lacks a focal point. Other great things about this particular heater are that it is extremely low maintenance even if it doesn’t seem so at first, and it only takes a single action ignition to make it work. Heaters that use infrared technology heat solid objects in an area, instead heating the air(convection). These heaters emit harmless, invisible infrared waves that quickly warm the area. Infrared heaters work fantastically in covered patio settings where they can be hung from the ceiling or installed flush; this helps maximize your usable patio space. These are the heaters that you find in bars and restaurants that offer al fresco seating arrangement. In residential spaces these are popular for installation around balconies as these heaters never take too much space. They are perfect for patios and go extremely well with outdoor sitting areas. These are sleek and compact and a modern touch to a lot of outdoor areas. You can install these patio heaters on the wall or the ceiling, they do not interfere with the outdoor furniture and have their own safety features so that they don’t damage in the face of harsh environmental elements. Full size units stand to around 8 feet tall and can generate 40,000 Btu or more. Smaller outdoor patios may allow you to take advantage of tabletop heaters, the smaller models usually generate 12000 BTU. If you are getting heaters that can be hung from the ceiling, their power varies a lot, depending on the size of the heater. You must consider the entire layout of your patio and decide whether you need a full size unit, or if smaller heaters are capable of heating your patio to a comfortable temperature. Out of the three popular fuel choices, propane allows patio heaters to be more mobile, and propane powered heaters are usually easy to use since you can carry them around and place them anywhere needed. However propane can be a bit pricier than other fuel sources. Natural gas is an inexpensive alternate. These heaters provide a comparable amount of heat, but are stationary and require a professional to install the heater properly. If you choose to buy an infrared heater, there won’t be any emissions, and the price range is pretty reasonable as well. Depending on the model that you invest in, you may have to have these professionally installed or plugged in. Of course, at the end of the day you want your outdoor patio heater to look stunning. The aesthetic appeal of the unit is more than half the fun. Outdoor heaters do a great job at complementing the whole design of your patio.